Jim Walters was a onetime fast food manager who was one of the seven individuals that were brought together by the mysterious Clinic for Paranormal Research after the White Event. They find themselves caught up in a conspiracy and flee the clinic after finding out that the clinic director intended on making an army out of the seven. Named the Displaced Paranormals- 7 (D.P. 7 #1 Nov. 1986) Walters and the group were recaptured, and Walters decided to stay at the clinic after the defeat of the clinics director. Walters was well like and jovial at the clinic, and refused to join the group of blacks who wanted to separate themselves when varies divisions started springing up among the patients at the clinic. 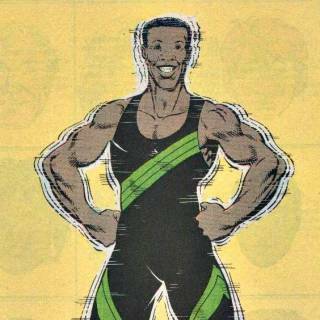 (D. P. 7 #14-16; 1987-88) Walter’s family was killed in the Black Event, (D. P. 7 #18; April 1988) and Walters was drafted into the Paranormal Platoon. (The Draft #1, 1988) Once things had finally ended and the war was over, Walters and the others try to return to normal lives (The War #1-4; 1989-90).